The Town of Balgonie was first settled in 1876 by Scottish settlers, and was established before the Canadian Pacific Railway (CPR) arrived in 1882. The town was named after Balgonie Castle in Fife County, near Glenrothes, Scotland. The town at one point was being considered as the capital of the North West Territories which encompassed Alberta and Saskatchewan in the late 1800’s and early 1900’s, but lost out to The Battleford for that right. The community was awarded status of a town in September 1907 and celebrated 100 years of incorporation on August 4, 2007. Balgonie is located 25 kilometers east of Regina on the Number 1 Highway. It is at the intersection of 4 major highways (364, 46, 10 and 1) and the CPR Mainline which parallels the number one highway. The community has been growing steadily for the past number of years in both residents and businesses. Balgonie is home to the largest rural high school in the province and also is home to the longest running outdoor swimming pool which open in the early 1970’s. Balgonie’s population has fluctuated over the years to its current high of 1379 (2006 Census) and as low as 588 in the 1960’s. Saskatchewan Health records show the population of Balgonie to be 1732 and the truth likely lies somewhere in the middle around 1600+. Balgonie has a rich history within the Canadian and Saskatchewan landscape. The first Canadian made and designed airplane model was flown off the Hyde Block building (Railway Street and Main Street). The first Canadian made engine was designed and built in Balgonie and later tested in a flight in Victoria. The engine from this historic plane is located in the National Aviation Museum in Ottawa and a replica of the airplane is located in the Smithsonian Museum in New York, and the BC Aviation Museum in Victoria. There are two different historical video’s created for this momentous piece of history. The Birdman of Balgonie is a clay animation short video sponsored by the National Film Board of Canada and The Birdman is a 45 minute historical video with various pieces used for the film located in the Balgonie Multiplex. There are some buildings remaining in the community from the late 1800’s with the Presbyterian Church being the oldest and currently undergoing restoration and will be opened in late 2007 or early 2008 as a museum within the community. Mandy Selzer rink winning Canadian Junior Women’s Championship in 2006, and World Junior Championship Silver. 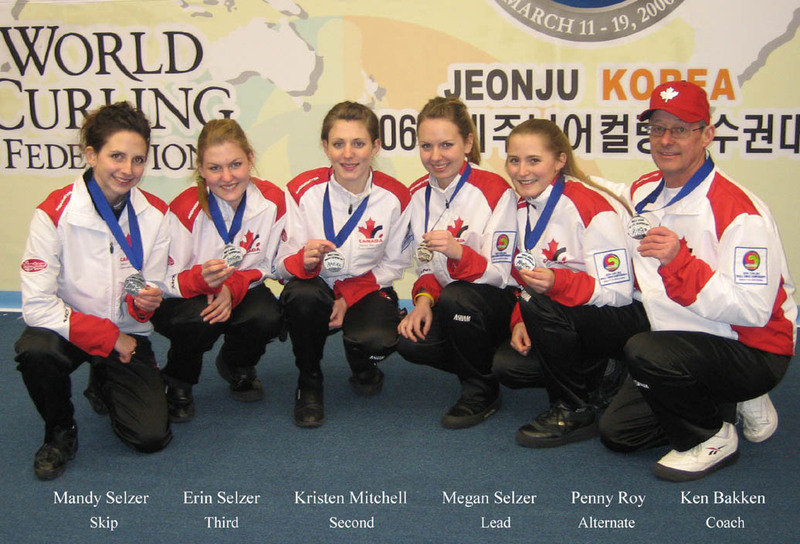 The team of Megan Selzer, Erin Selzer, Kristen Mitchell and Mandy Selzer won first the provincial title in January 2006, then won the Canadian Championship in February 2006 and were off to Korea for the Junior Women’s World Championship. They had a good round robin placing second and started the playoffs well until the skip and some of the other team members obtained food poisoning. Coming off being sick the ladies performed valiantly and brought home the silver in a close fought final game with a good Russian team. Early in the 20th Century William Wallace Gibson was living in Balgonie running the store and dreamed of flying. He worked on plane models for a long time and tested those models off the top of his store. He finally found a model that he thought would work and started building his flying machine. He managed to make a manned flight from the top of the store building (Hyde Block currently Cross Country Foods) and landed a couple of hundred feet away. That initial success provided a thirst for longer flights and having spent most of his money building models and testing them he sold all his possessions in Saskatchewan and moved to British Columbia where he continued to build models and make successful flights. He managed to make the first manned successful flight takeoff and landing with a purely Canadian design and built aircraft and missed being the first manned flight in Canada by a few months. This great man truly helped Balgonie take flight. In 1882 the Countess of Stathmore named the Town of Balgonie after Balgonie Castle. The castle is located on the outskirts of the town of Glenrothes, across the Firth of Forth from Edinburgh, Scotland. It is midway between Milton of Balgonie and Coaltown of Balgonie in Fife County. The Sibbald family inhabited Balgonie Castle before 1246. Sir Duncan Sibbald of Balgonie is mentioned in a Papal Bull of 1250. It is thought the tower was built in 1360 for Sir Thomas Sibbald, Treasurer to King David II. The tower is the oldest complete one in Fife and is accepted as one of the finest examples, of its type in Scotland. Balgonie Castle has a long and storied history which is outlined on it’s website at www.balgoniecastle.co.uk , and has had numerous storied visitors over the years. Today the castle is home to Raymond Morris of Eddergoll, and is a back drop for weddings, anniversaries and other functions. Mr. Morris is continuing a restoration of the castle while he makes the tower his home.